COMMISSIONER MORMAN poses after his talk, with Chamber board members and staff. 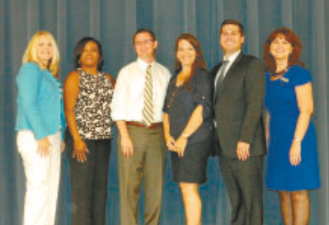 L to R, Christie Gates, Shalonda Dawkins, Commissioner Morman, Kim Gonzalez, Adam Lund, and Margie Buentello. Precinct 2 county commissioner Jack Morman was in good form last Friday, as he addressed a friendly crowd and brought them up to date on activities in East Harris County. Morman started by noting the death of Deputy Darren Goforth that week with a moment of silence. Then he moved on to some lighter fare, chiding NC Star publisher Gil Hoffman for commenting on his “East Harris County” attire at a recent meeting with a lack of tie and suit coat. But Morman’s talk contained some serious business, stating that despite the state’s reluctance to remove toxic material stored in waste pits in the San Jacinto River, his opinion was that the pollution had to be completely removed, and he felt the county and his own position would support that. He said that the TDEC studies did not adequately account for catastrophic events such as Hurricanes and storm surges, that could dislodge pollutants and further endanger residents in Channelview, Highlands, and other river communities nearby. He noted that environmental studies of the river were continuing, with the Galveston Bay Foundation conducting a fish study, and a well water feasibility study also underway. Morman mentioned the bond issue that will be on the ballot in November. He noted that their were four issues to vote on, and that Precinct 2 would receive $160 million total for roads and drainage, parks, and other needed improvements. He emphasized that if passed, it would NOT mean an increase in the tax rate for the county. By any standard, it was a good football game. In some high school football circles, it was the game of the week. 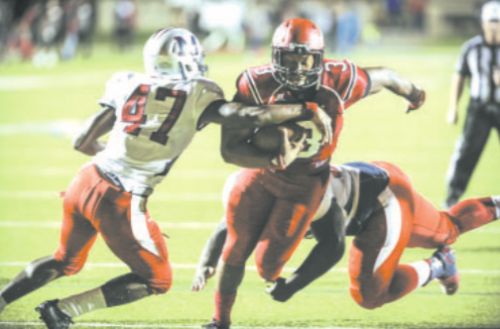 The North Shore Mustangs, ranked number three in the area vs. the Manvel Mavericks, ranked number four. The Mustangs got off to a commanding start, forcing turnovers and a punt on the Mavericks first three possessions. However, as both teams’ offenses got into a rhythm, the defenses had their hands full stopping the potent passing attacks of the opponent. The Mustangs led most of the game, but a fateful interception returned for a touchdown, putting the Mavericks ahead by seven. The Channelview Falcons’ high-powered offense was true to form as they easily defeated South Houston 56-15 last Friday, Sept. 4 at Ray Maddry Memorial Stadium. 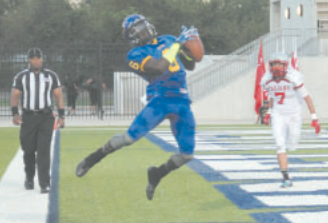 Channelview improved its record to 2-0 on the season and will host Vidor at 7 p.m. on Friday. The Falcons churned out 529 yards of total offense with a balanced running and passing attack. Quarterback Jalen Hurts threw for 236 yards and two touchdowns and also ran for two scores. Andrew Baker was Channelview’s leading rusher with 90 yards and a touchdown, while Demontre Tuggle, Cristian Ramirez, Ashton Turner and Hurts helped account for the Falcons’ 247 yards on the ground. 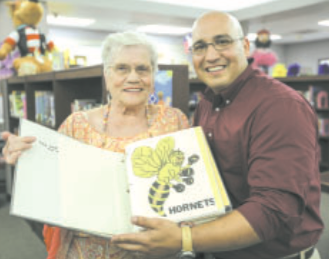 Woodland Acres Middle School Principal Lee Ramirez (right) enthusiastically accepts a scrapbook of the school from the 1940’s from Pat (Bowles) Cooper (left). 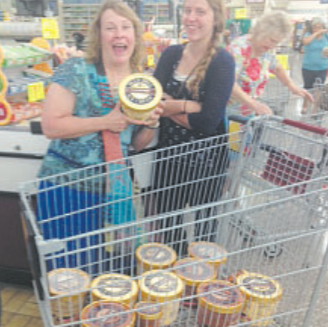 Galena Park ISD’s Woodland Acres Middle School (WAMS) welcomed a group of historical visitors on Friday. Pat (Bowles) Cooper and her entourage, all students at Woodland Acres Junior High as it was known back in the 1940’s when they attended, kept a scrapbook chronicling news articles and other goings on at the school and community. “There’s just a lot of history here,” Cooper said. “I can’t think of a better place for the book than right here where it all started,” she added. The book consists of numerous photos and news articles, including the first teachers and principal, various extracurricular groups such as football, band and track, and student photos. Lee Ramirez, principal of WAMS, was grateful for the historical document. “This is a treasure. We couldn’t buy the history that’s in this scrapbook. That makes it priceless. This will be proudly displayed for all to see, so our Hornets can learn what made this school what it is today,” said Ramirez.